I honestly can't decide if Wireless USB is going to be the next big thing or if it's merely a kludgy solution to a valid problem. The idea is a good one: free your peripherals from the hassle of wires by replacing their USB cables with a wireless version of that protocol, based on a technology called Ultra-wideband (UWB). Only we've been hearing about Wireless USB and the first devices have yet to materialize. 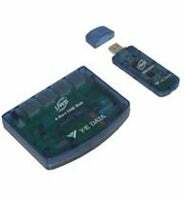 Japanese vendor Y-E Data, Inc. is poised to release the first Wireless USB hub in October. It's a lot like your standard USB hub, except that instead of plugging the hub into your computer, you plug in a USB dongle that looks like a flash drive or Bluetooth adapter. It enables your computer to communicate wirelessly with the devices in the hub as if they were USB devices connected to your computer. This is just a stopgap, of course, since you still have to connect wires from your peripherals to the hub. Still, at a range of 10 meters, you can put your peripherals in, say, another room in your house. But at a cost of between $210-$340 dollars it's going to be a bit more pricey than, umm, a long USB cable. The goal is to start integrating Wireless USB into devices like digital cameras and printers. Of course, Wi-Fi and Bluetooth have already started down this road. Then again, is there such a thing as too much wireless goodness?